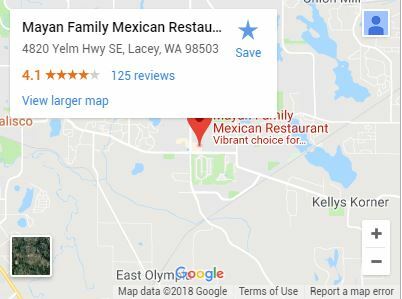 For residents of Tumwater looking for a change in their weekly restaurant routine, Mexican food provides an expansive menu of fresh, authentic Mexican food that’s rich with flavor and filled with character. 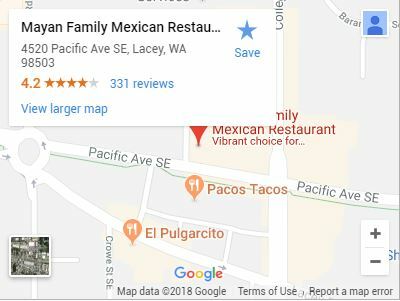 Our premier location first opened its doors in 1996 and after proving a hit with local restaurant-goers, became a draw for Tumwater residents. Since our inception, our restaurant has been completely family owned and operated, and despite our growth, we’ve never skimped on quality. We want every single one of our guests to sense the pride we take in the dishes we create. In every bite, we want our patrons to experience a true taste of Mexico and a fusion of flavor that’s hard to beat. From our Burrito Supreme that’s packed with chicken, beef, pork, or flavor-packed chile colorado, to our amazingly fresh seafood options and sizzling fajita plates, every dish on our menu is full of flavor and guaranteed to please. 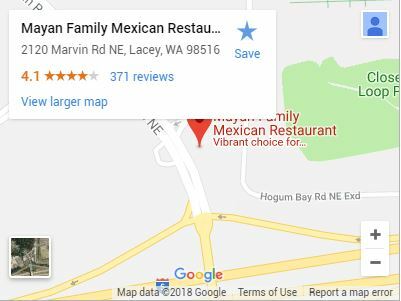 Mayan Family Mexican Restaurant is there no matter when your appetite hits, and no matter what you’re hungry for. Our grande-sized brunch options are the perfect fix after a late night out. For those looking for something All-American, our kitchen also serves up burgers and steaks grilled on the spot. And of course, our fully-stocked bar keeps margaritas, mojitos and cold cervezas flowing all night. 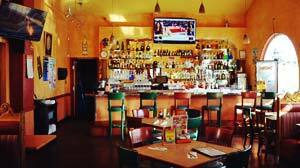 With live music and a family-friendly environment, Mayan Family Restaurant can be relied on for any occasion, any day of the week. Whether it’s a party reservation or dinner for two, we invite you to come in and make yourselves at home. Looking for the next place to host a birthday dinner for your relatives? Come in for a memorable flavor fiesta and let our family, take care of yours. Our attentive staff is always happy to serve you in-house and always looking forward to taking your order over the phone for fast takeout when you don’t feel like cooking. Because we’re part of the community, we always do our best to provide first-class service to our friends and guests. We take pride in all the food we serve and 100% customer satisfaction is always our number one goal. Because we stand behind our food, if a dish is ever served that’s not up to our standards, we will always try to make it right. If you’re feeling hungry for something exciting, come on in to Mayan Family Mexican Restaurant today to find out what you’ve been missing.